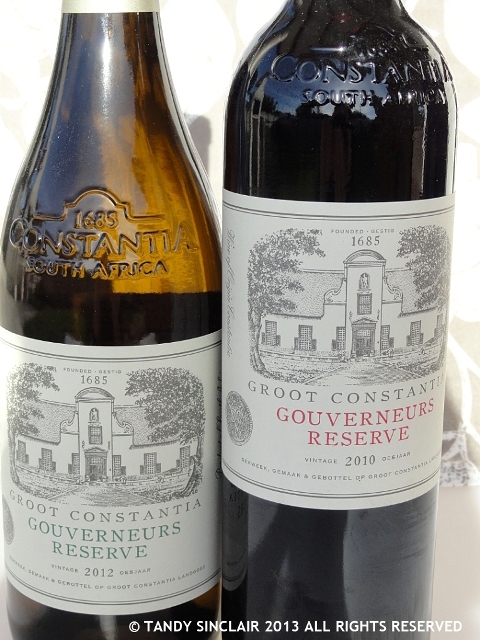 328 years ago, Simon van der Stel, the Governor of the Cape of Good Hope chose a parcel of land in Constantia on which to grow grapes, and make wine. Wine making was his hobby and this passion has turned into an estate which uses all the grapes it grows in order to make wine under its own label. Groot Constantia is 170 hectares and includes vineyards, 2 wine tasting venues, 2 restaurants as well as historic buildings, including the Manor House and the Cloete Cellar. Wine has been made on the estate without interruption since 1685. 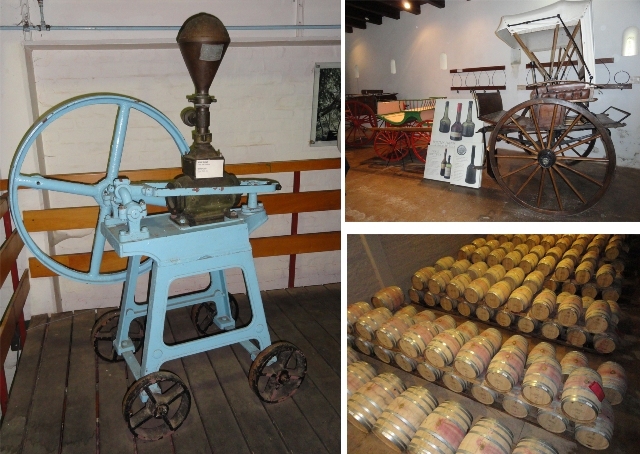 Groot Constantia is owned by the Groot Constantia Trust, and is run by a Board of Custodians. It is branded the Nations Estate and in effect belongs to the people of South Africa. The Gouverners range of wines are single vineyard blends. Our tasting consisted of the Gouverneurs Reserve 2011 white which is a blend of semillon (82%) and sauvignon blanc. It has guava on the nose and a grassy taste and is very fruity. The wine is not yet available for sale and we have been asked to keep the bottle for a while before opening it. The Gouverneurs Reserve Red 2010 (R262/bottle) is a Cabernet Franc / Cabernet Sauvignon / Merlot blend. This Bordeaux style wine has a berry nose and is dry on the palate with a lot of fruit. Harvest time begins in January on the estate and lasts until Mid April. Only one vineyard is harvested at a time and only the ripe grapes are picked. This means that some vineyards are picked three times. Cabernet Franc grapes will be harvested before the Cabernet Sauvignon, and the muscadel grapes used for the Grand Constance will be left on the vine until they are as dry as raisins. It is this that makes the wine have a liquid amber feel to it. All sticky and sweet and a beautiful nose of rose and honeybush. White grapes are picked early in the morning as the sun increases the alcohol level in the grapes. They then make their way straight to the receiving bin. The grapes are then removed from the stalks before being sent to the crusher and the pneumatic press. These are then sent to stainless steel tanks to allow the fermentation process to begin. Fermentation is started with the addition of commercial yeast to the grape juice. Yeast + sugar (in the grapes) → alcohol + CO2 + heat. Because of this, the tanks are vented on top to allow the gasses to escape. The tanks are chilled and the wine is left to ferment for 21 days. Protein exists in the wine and this makes it murky. Bentonite clay will then be added to clarify the wine. The wine will be filtered before being put into the bottle and corked with a proper cork as this allows the wine to breathe. Bottle shock occurs and the bottles need to be left untouched for 6 – 12 weeks for the wine to settle. Red wine making is slightly different as the juice needs contact with the skin and pips to give it colour and tannins. It is the tannin component in the pips which enables the red wine to mature. The red grapes are mashed before fermentation which is done in tanks. The yeast is added and the juice is left to ferment at room temperature for 10 days. It then passes through the press before going into a stainless steel tank to allow maleolactic fermentation to take place. The wine is then placed into oak barrels for 12 – 18 months, or stainless steel tanks before being blended. The estate uses a combination of oak barrels and stainless steel tanks as at a cost of €800 (+R8000) an oak barrel, fermentation costs would be quite high if they relied on oak alone. The harvest will result in 5000 bottles of wine being produced. It goes without saying that good grapes produce good wine and the wine from the estate is very good. 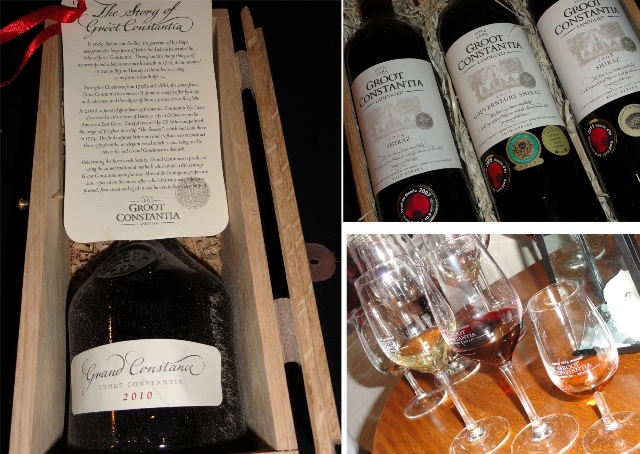 Disclosure: I was invited to attend a media day at Groot Constantia. I was not required to write a blog post and any opinions and facts expressed herein are my own. This post is in line with my blogging policy. I swear, you go on the BEST field trips! !